Interesting Page One compare ‘n’ contrast in today’s Boston dailies: The Globe front-pages a story the Herald doesn’t have at all, and vice versa. So, to recap: One search, two clicks, still no David Ortiz. Try it for yourself. It’s crazy-making. And entirely crazy: a non-searchable newspaper website. As the Carmine Hose continue their pitched battle with Tampa Bay for fourth place in the American League East, the team has launched Fan Appreciation Week for the season’s final seven games. First off, 1 final homestand? Is David Ortiz retiring? Or going elsewhere? Cause he sure doesn’t sound like it in this Peter Abraham wrap of yesterday’s dramatic win over the Blue Jays. At 39, Ortiz is watching these final weeks of the season like a scout, hoping to see players who can form the core of a contending team before he retires. 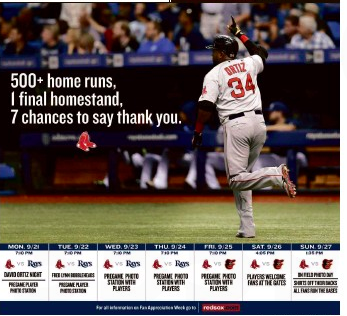 Is the team trying to tell Ortiz something with this ad? Regardless, the season’s final week, for those of you keeping score at home. That’s a lot of appreciating, eh? Then again, they probably don’t appreciate it at the Boston Herald, which once again struck out in the advertising department. Just not at the thirsty local tabloid. 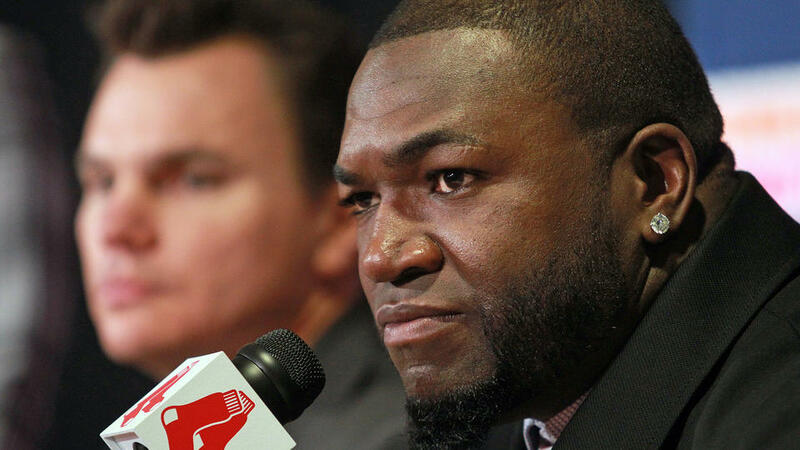 Within a half-hour of Ortiz’s post being published on The Players’ Tribune on Thursday night, The Boston Globe rushed onto its website a similar article, the product of an interview Ortiz gave March 11 to one of its reporters, Bob Hohler. That piece had been held since last week so it could be the centerpiece of The Globe’s Major League Baseball preview April 5. 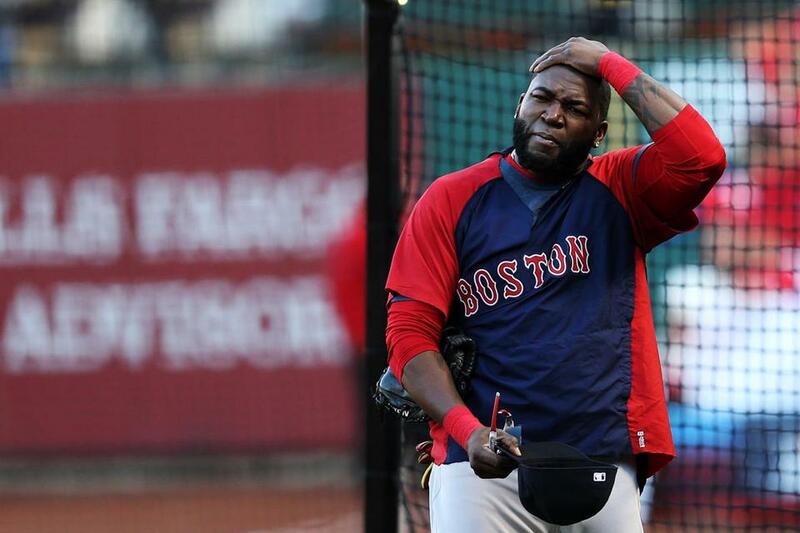 Then again, this morning wasn’t so great for Ortiz. Big Papi Goes in the Tank! For starters, let’s stipulate that when it comes to home run showboating, David Ortiz can’t hold a candle to Manny (Let Manny Be Money) Ramirez. But Ortiz puts on a pretty good showboat himself (see especially from 1:11). 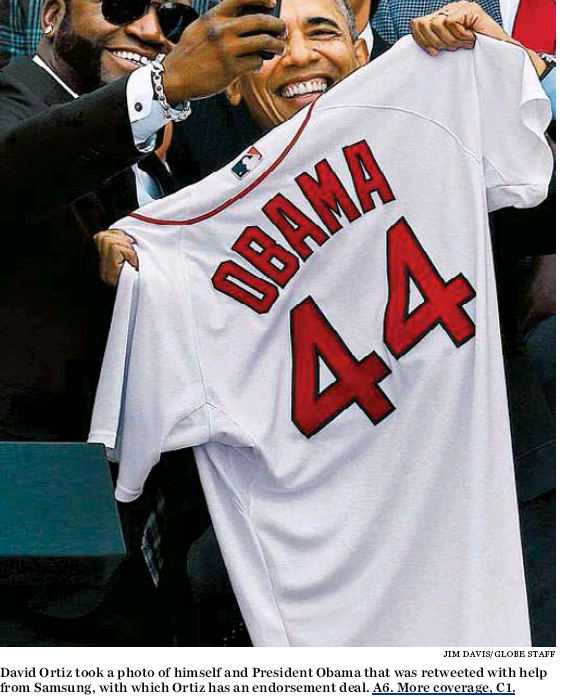 So it was no surprise when Big Papi showed up in Tank McNamara on yesterday’s Boston Globe Scoreboard page. 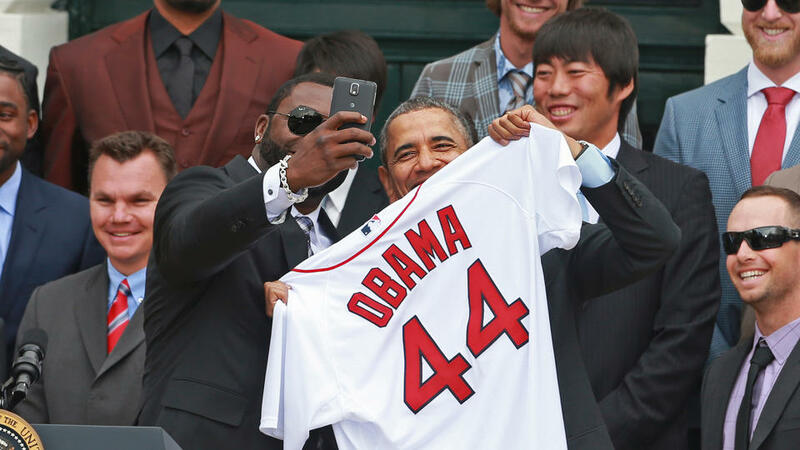 Given his White House selfie, neither is David Ortiz. Socrates said “The unexamined life is not worth living.” Feh. Nowadays, it’s the unsponsored life that isn’t worth a damn. Staged selfies might be the name of the game. It started at the Oscars with Ellen DeGeneres’s epic picture of celebrities and now it appears David Ortiz himself may be in on the action. 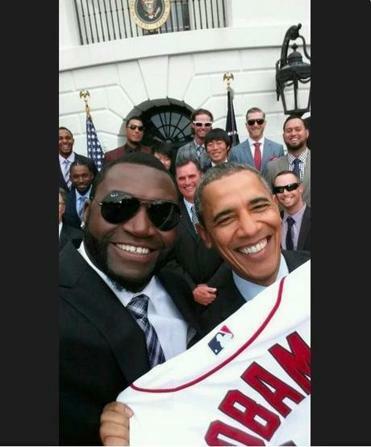 Samsung confirmed that it had helped Ortiz take Tuesday’s selfie with President Obama. The mobile provider then promoted the picture on Twitter to the company’s 5.2 million followers. Trade publication Sports Business Journal reported on Monday that Ortiz had inked a new endorsement deal with the cellphone provider. So the president of the United States is just a prop for a cheap marketing stunt, eh? Crosstown, Boston Herald columnist Steve Buckley missed the Samsung connection but bought the package. Michael Kennedy and Edward Walsh, who lost their lives battling last week’s Back Bay inferno. He introduced ailing former Boston mayor Tom Menino and his wife. The president told us when it was time to be solemn. 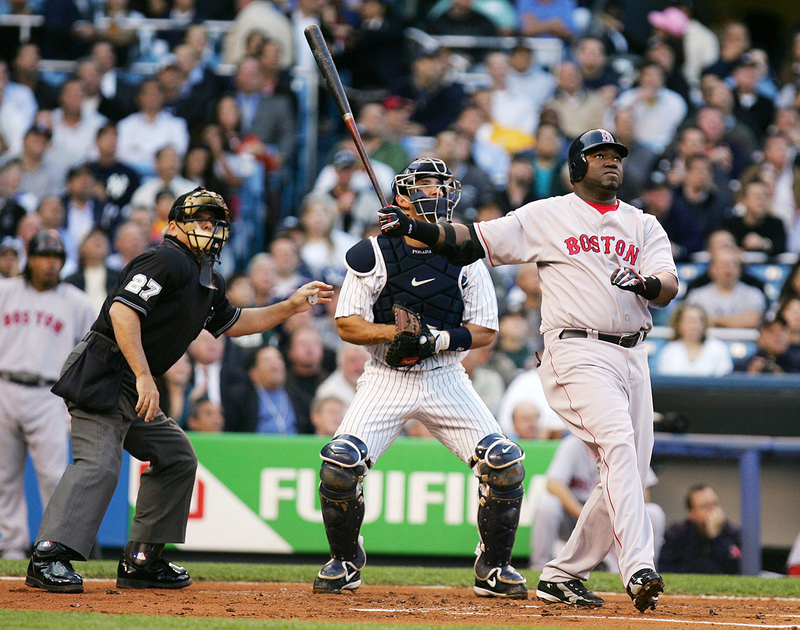 David Ortiz told us when it was time to have a little fun. And Samsung told us when it was time to buy.